The Ruby-throated Hummingbird is the only hummingbird breeding in eastern North America and is a familiar summer inhabitant of gardens, parks, and woodlands from mid-April to early October. In the fall it flies nonstop across the Gulf of Mexico, a distance of nearly 500 miles and taking 18 to 20 hours under favorable conditions, to winter in southern Mexico or northern Central America. To accomplish this tremendous migration, a hummingbird will double its body mass by fattening on nectar and insects in the weeks prior to departure. Description: This tiny bird has a long thin bill and an iridescent green back. Both the male and female are white below, but the male has a brilliant iridescent red gorget (throat) that can look black under certain lighting conditions. Juveniles (June-September) look like the adult female, but juvenile males often develop a few red feathers in the gorget by the end of the summer. Voice: The song is a rapid series of high-pitched squeaky notes. No other hummingbird species breeds in Tennessee, but several Western species have been found in the state during the non-breeding season. They arrive anytime after late August and usually depart in April. As of 2008 a total of 7 Western species had been recorded: Rufous, Black-chinned, Allen's, Anna's, Calliope, and Broad-tailed Hummingbirds, and one Green Violet-ear. Some of these birds have been banded, so we know that some individuals have returned to the same yard for several years in a row. Habitat: Breeds in mixed woodlands and eastern deciduous forest, gardens, and orchards. Winters in tropical deciduous forest, tropical dry forests, scrubland, citrus groves, and second growth. Diet: Flower nectar, small insects, and tree sap. Readily uses hummingbird feeders. Nesting and reproduction: Males establish territories soon after they arrive in spring and will mate with several females. The male has no further role in nesting. Clutch Size: 2 (pea-sized) eggs, rarely 1 or 3. Incubation: The female alone incubates the eggs for 12 to16 days. Fledging: The nestling period can vary from 14 to 31 days, probably due to the availability of food, 18 to 23 days is normal. When they leave the nest, the young are considerably larger than their mothers, and will be fed by her for another 10 days or so. Nest: The walnut-sized open cup nest is built by the female on top of a small tree branch, often over a stream or other opening. The nest is made of thistle and dandelion down, held together with spider web, and covered on the outside with lichen. The nest will stretch to contain the growing nestlings, and may sometimes be reused (rebuilt) the following year. Status in Tennessee: Common summer resident and migrant at all elevations across the state. The population is stable or slightly declining. 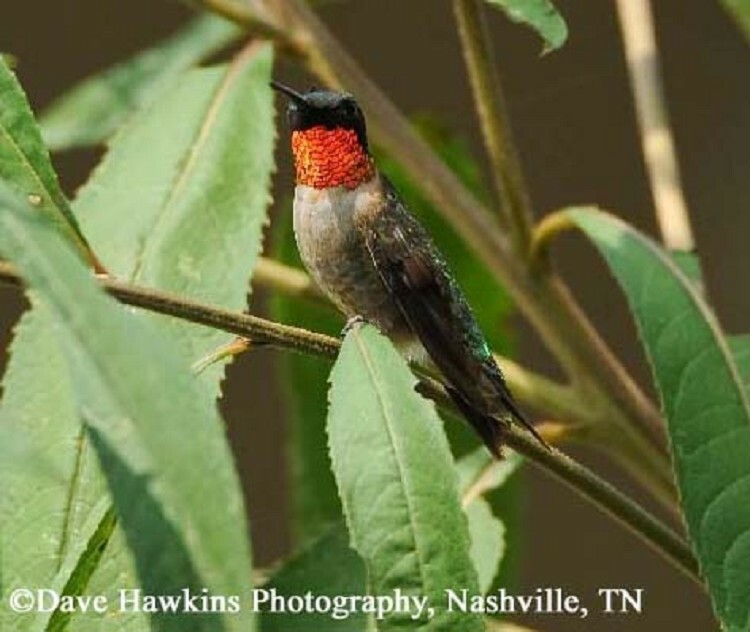 In one yard in Nashville, 353 individual Ruby-throated Hummingbirds were banded between 8 June and 23 September 2008, including 13 recaptures (2 of these birds had originally been banded as adults in 2004) (S. Bivens pers. com). The number of Western hummingbirds wintering in Tennessee appears to be increasing. Before the late ‘80s there was only one record of a Rufous Hummingbird. As of the winter of 2007-2008 there had been over 100 records. This is either because the actual numbers of hummingbirds is increasing or because more people are leaving their hummingbird feeders out into the fall and report birds that visit them. The Ruby-throated Hummingbird beats its wings an average of 53 times per second. Though most hummingbird feeders are red, the location of a feeder is more important to hummingbirds than the color of the feeder. The oldest known Ruby-throated Hummingbird was 9 years old. Best places to see in Tennessee: Suburban neighborhoods with mature trees and shrubby cover nearby. They are found in all counties in Tennessee in spring and summer. Robinson, T. R., R. R. Sargent and M. B. Sargent. 1996. Ruby-throated Hummingbird (Archilochus colubris), The Birds of North America (A. Poole and F. Gill, eds.). The Academy of Natural Sciences, Philadelphia, PA, and The American Ornithologists' Union, Washington, D.C.